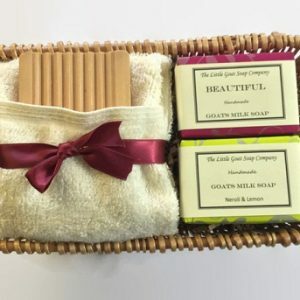 4 Goats Milk Soaps of your choice, along with a 100% 600gsm Egyptian Cotton Facecloth beautifully presented in a High Quality Wicker Basket. I love my gift basket which my husband got me for Christmas. It’s beautiful, smells wonderful and I can’t wait to use all of the soaps.